Here is recent popular stock charts with AbleTrend guidance chart applied. AbleTrend signals are award-winning and time-tested since 1994. 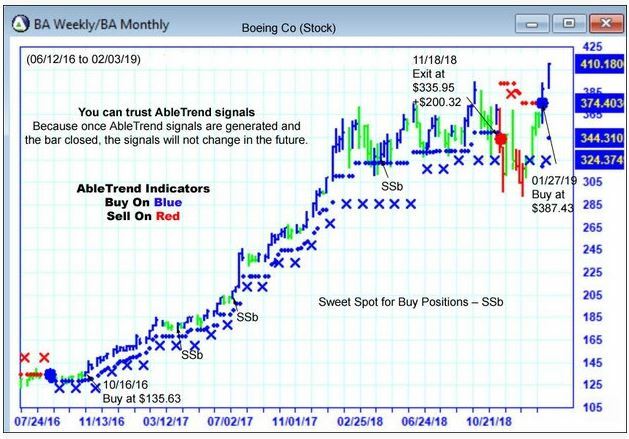 As you can see in the above charts, the AbleTrend Guidance Chart combines 2 time frames into 1 chart and helps to filter out false signals. Within one chart it helps traders to detect the market trend with longer time frames (avoiding market noise with shorter time frames), and yet it empowers traders to manage risks with tighter stops (compared to stops with longer time frames) and to get better entry prices. Once you have a blue price bar/ blue small dot and blue X that would be triple confirmation for a valid AbleTrend buy signal. Similarly, once you have a red price bar/ red small dot and red X that would be triple confirmation for a valid AbleTrend sell signal. 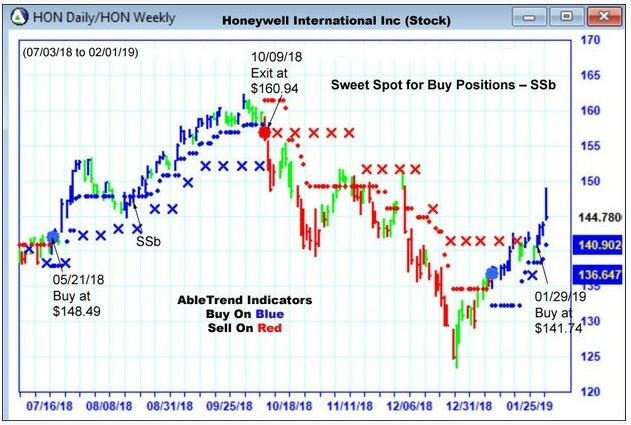 Below is the stock chart of BA and HON with AbleTrend guidance chart applied. 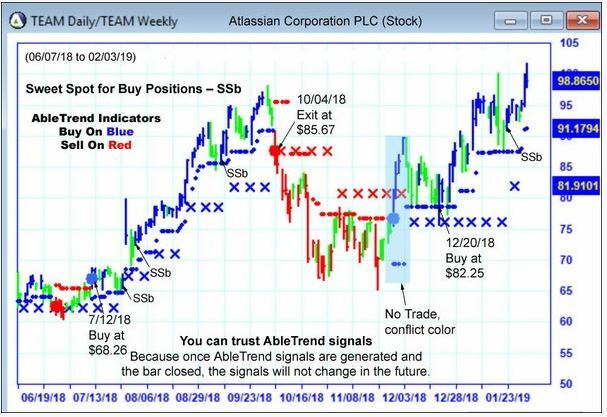 View more recent stock charts with AbleTrend signals, or learn more in AbleSys webinars, or give a trial with hands-holding one-on-one consultant today. I have been using Ablesys since 2008. The trend identification coupled with the stops and profit targets is exceptional. I have used other software and have been extremely disappointed. It is crucial that you follow the software precisely and that you attend the webinars so you are constantly updated on product enhancements. Ron, the trainer is always available by email and phone if you run into problems. I read some of the bad reviews and I was shocked and saddened that people would say anything bad about Ablesys software. My bad days are few and my losses are limited. My good days are often and my gains are off the charts (no pun intended). IMHO, if you want to make serious money and limit losses, Ablesys is the only way to go! When I first started I took advantage of the new users reduced monthly introductory rate. If I were new to Ablesys, I would start with the introductory rate and then decide what type of commitment you want to make. This is all my opinion due your own Due Diligence and then decide for yourself. Good luck and happy trading with Ablesys.